These are some of our adopted blinkies that we find are for a good cause. Please click on the Blinkie for designer's website. Below each of the groups of blinkies we have included credit to the designer. Please give designer full credit! Copyright ©1996-2009 Marvel Creations. All Rights Reserved. All matching images and content created and designed by ©Marvel Creations 1996-2009 which began May 29, 1996. These graphics are for the "exclusive" use of My Parents Are Survivors. Please do not take! Thank you! 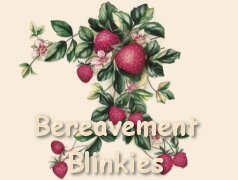 Thanks to Beckie Clymo for the creation of our bereavement blinkies and mantles!